MUSKOGEE, Okla. -- An Oklahoma couple is showing the world that "through thick and thin" starts before marriage. Police officers were arresting Brandon Thompson, 35, at his Muskogee home on July 4 when he made an odd request. He wanted to propose to his girlfriend, Leandria Keith. 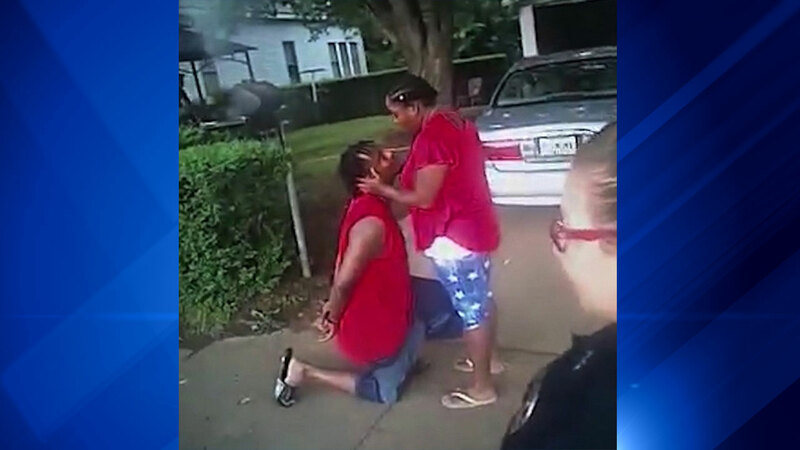 A police body camera caught the moment Thompson got down on one knee. "I didn't want to part ways with her not showing exactly how I feel for her," Thompson told CNN by phone. "I want her to be my wife for the rest of my life." The family was celebrating Thompson's birthday and Independence Day -- which fall on the same day -- in their front yard when police officers showed up. Officer Bob Lynch had seen Thompson earlier in the day and recognized him from the several felony warrants out for his arrest, so he followed him to the home. The officers were in the process of detaining Thompson in the front yard when the suspect made his request. "I asked the officer if I could propose," said Thompson. "The officer said, 'You want to do what?' and I said, 'I want to propose to her.'" Lynch and his partner, Officer Lincoln Anderson, agreed to let him do it. "It took us by surprise that he asked if he could do it," Anderson, who is also the Muskogee police spokesman, told CNN via Facebook. The bodycam video shows Thompson asking his mother if he should "do it now" and told her to get the ring. That is when he got down on one knee. "I love you," Thompson is heard saying. "Will you be my wife, please?" Keith said yes. The officer wearing the bodycam is then seen switching Thompson's handcuffed hands from his back to his front so he could place the engagement ring on Keith's finger. "I was shocked," Keith told CNN. The couple has been together since May 2016. They told CNN they will set a date for their wedding once Thompson's legal troubles are resolved. "When you're in love with somebody and you know that you want to spend the rest of your life with them, you just want them to know how you feel," said Thompson. "I wanted a new start for me and with the police taking me to jail I didn't have to worry about my warrants anymore." Thompson said he has been "doing a lot to turn his life around." He has been coaching a peewee football team, which gives him an opportunity to give back to the community, he said. "So many young kids grow up without fathers and don't have the correct type of guidance," said Thompson. "I've been down that road before. I don't want them to make the same mistakes I've made." Muskogee County District Court documents show Thompson had six felony warrants out for his arrest. Anderson told CNN that the bench warrants were for failure to appear in court or failure to pay. "He told me two weeks before, 'Mama, can I come home because I'm tired of running,'" Thompson's mother, Judy Peal, told CNN. "When the police arrived I told him, 'Place your hand in your mother's hand and we'll walk out.'" The bodycam video shows Thompson promising his mother and new fiance that he will turn his life around and "get a job." Keith pulled the couple's savings together to bail Thompson out of jail. He was released the day after his arrest. Thompson's next court appearance will be July 17. Anderson says he hopes that allowing Thompson to propose will show people the human side of policing. "We all want to see someone get their life on track," said Anderson. "Hopefully it will help him make the choices it will take to support his future wife and his kids. And if by letting him take a moment before going to jail to do what he did, then we did our jobs." Peal told CNN the police officers were "wonderful" for letting her son propose to Keith while under arrest. "Police officers are human. We care about the city we serve and the people in it," said Anderson. "Sometimes the smallest gesture of kindness is the biggest influence in someone's life."